Bacteriocins are a heterogeneous group of peptides or proteins with antimicrobial activity synthesized ribosomally and released extracellularly by bacteria belonging to nearly all taxonomic groups. These are classified according to their genetic, structural and biochemical characteristics. Use of bacteriocinogenic cultures to improve the safety of food products would represent an attractive alternative to the use of chemical preservatives, based on the long history of safe use of naturally occurring bacteriocin producing food-grade bacteria. 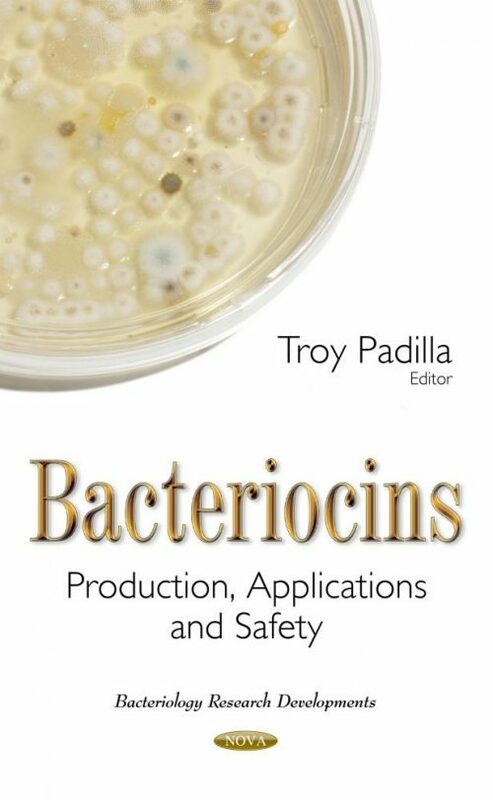 Chapter One in this book discusses the effects of bacteriocin production in situ by bacteria in food products and evidence for the probiotic properties of bacteriocin producers are collected in order to identify processes in which the application of bacteriocinogenic cultures can be effectively implemented. Chapter Two examines the importance of the use of bacteriocins in food preservation and also their potential use in human health. Chapter Three discusses a broad range of bacteriocin applications focusing not only on food biopreservation but also on biofilm control. Chapter Four reviews the recent applications of bacteriocin-producing PC in meats and meat products throughout the world. Chapter Five evaluates the effect of mild pressure treatments in the survival of Pediococcus acidilactici HA-6111-2 and on its bacteriocin production capacity.